365 RosariesBlog: Today, July 18, we celebrate the feast day of Saint Frederick (died 838), bishop of Utrecht and Martyr of the faith. What we know of Saint Frederick was recorded by his contemporaries, who praised his wisdom, prudence, piety, and virtues. Poems and hymns were written in his honor. Saint Frederick composed a prayer to the Holy Trinity, which was used in the Netherlands for centuries. While little is known of Saint Frederick’s early life, his Acts record that he was trained among the clergy of the Church of Utrecht, where he excelled in piety and sacred learning. Having been ordained, he was charged by Bishop Ricfried with the care and instruction of the newly converted to the faith, and in 825, was selected to assume the bishopric. 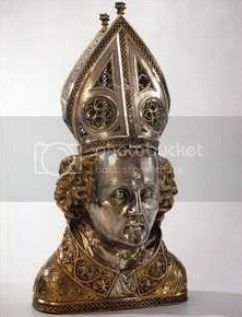 With great zeal, Frederick worked for reform and order throughout the diocese, and expanded the faith by sending Saint Odulf and other acclaimed preachers into the northern parts of Holland to work against the paganism that had taken root there. Given his reach and reputation, Saint Frederick was soon embroiled in the political matters of the times. Saint Frederick found himself in the position to admonish the Empress Judith, after her sons raised charges against her, citing immorality. While Frederick spoke to her with patience, prudence, and charity, she became irate, and worked to undermine him. Similarly, he raised the ire of many of those throughout the land who did not ascribe to the Christian faith, enforcing marriages, and spreading the Gospel. Through his labors, he found himself greatly disliked by many dangerous and powerful individuals. Saint Frederick refused to be intimidated, however, certain in the power of the Lord. On July 18, 838, following celebration of the Mass, Saint Frederick was stabbed by two assassins. He died only minutes later, reciting Psalm 144, “I will praise the Lord in the land of the living.” It is unclear as to who had ordered the assassination, but historians agree it was due to his preaching and enforcing of the tenets of the faith. As such, the Church considers Saint Frederick a holy Martyr, having given his life to the faith, and suffered death as a consequence. 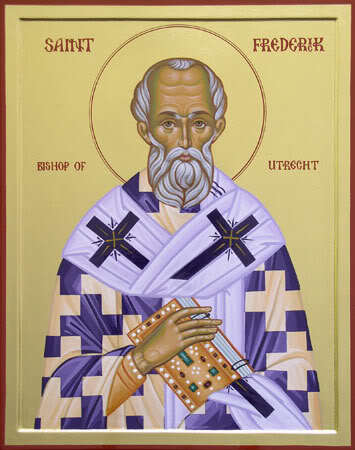 Grant, we beseech You, Almighty God, that poor in spirit after the example of Your abbot Saint Frederick, we may imitate Him who handed Himself over for the salvation of the world: Jesus Christ, Your Son, Who lives and reigns with You in the unity of the Holy Spirit, one God forever and ever. Amen.